I feel the overall message in Brave New word is that civilization will ruin us. Depending on what path we take our future could be devastating. I think it is sending the message that we need to be careful on out action and how we treat the world. 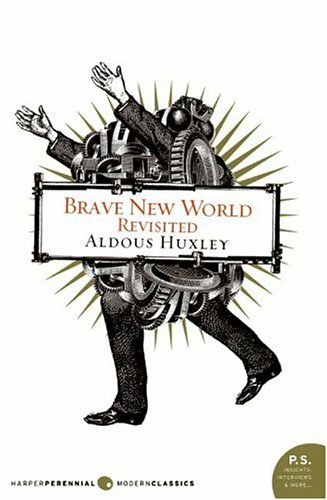 Brave New World made me think of the concept of happiness that we are lucky. I Figure happiness is having free will and needing to take soma to cope with what your life is like. Also it makes me think of how happy would I be in this world would I be in the system or not I really can't tell. When John says nothing in civilization cost enough it means that you can do whatever with no consequences. like when you hurt yourself you can just take soma or like they got rid of all the bugs so they didn't have to deal with them. Also it seems like someone is always telling you what to do so you can't even do somthing your not supposed to. If I were to give percentages on what I think this world focuses more one truth and beauty or comfort I would have to say sixty-five percent to comfort and forty percent to truth and beauty. I feel it is that way because you can't go a day without seeing a add or even just thinking you want something you don't have and I feel it may have gone a little too far. But then there are those dreams it seems like everyone wants to find a wife and and kids and settle down. At least thats the “ideal” life so I think a fair amount goes to that. That is what I think. While I was in the seminar I felt I did very well on perspective because I added on a lot of comments and I looked at their point of view threw my eyes so I could know what they were trying to say. If I still didn’t see it I would just say my opinion. I felt it was the best way to keep the conversation going. I also looked at the point of view through the article itself. One move I need to work on is making sure everyone gets a turn to talk because I found myself talking a lot when someone else was trying to. I will achieve this by waiting a little longer to talk also by making my points short and to the point or ask other people if they want to talk before I do. Some insight I got during the seminar was how some people think elementary school is too young to start doing more than one draft on a paper. That is a awesome seminar reflection. I think Uno has to wear a mask to act like he is the tough one protect Danny because Danny is this really skinny shy dude that won’t really advocate for himself he will just let others bully him but luckily he has Uno to be the tough guy he can’t. Danny’s mask was that he was just neutral behavior meaning he acts like he doesn’t really care he is always shrugging when someone asks him a question. New insights I have from reading this book is how not everybody has a nice home with two parents that take care of them and nit everybody has a nice team and baseball field they can play on. I also learned how much more racism there actually is that what most of here in Durango think.